Norman Thagard is a retired American astronaut and veteran of five spaceflights (including the first by an American on Soyuz) who, in 1994-95, set a new United States space endurance record of 115 days during his stay aboard Mir (the previous record of 84 days having been held by the crew of Skylab 4). Thagard received a B.S. (1965) and a M.S. (1966) in engineering science tended from Florida State University, a doctor of medicine degree from the University of Texas Southwestern Medical School in 1977, and was on active duty with the Marine Corps Reserve from 1966 to 1971, rising to the rank of captain. 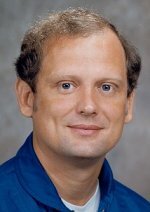 Selected as an astronaut candidate by NASA in 1978, he served as a mission specialist on Shuttle flights STS-7 (1983), STS 51B (1985), and STS-30 (1989), the payload commander on STS-42 (1992), and the cosmonaut/researcher on the Russian Mir 18 mission (1995).